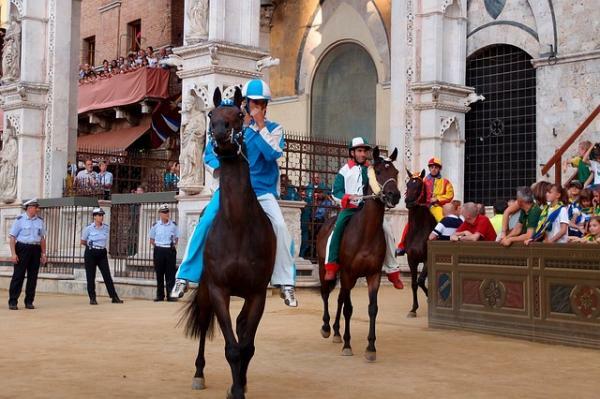 The Palio di Siena is the most famous horse race in Italy held twice a year, on July 2 and August 16 in Siena. Each year it attracts a large number of visitors and spectators from around the world. The traditional event dates back to the middle ages and represents a competition between the contrades, or city wards, of Siena. The race itself circles three times the Piazza del Campo. Victory goes to the first horse to complete the three laps of the square, even if it arrives at the finishing post without a rider. It is a dangerous race and too often the scene of tragic accidents: on average more than one horse dies each year, in most cases injured during the race and shot away from the cameras ... cameras that transmit the image of a folkloric and innocent event that leaves no room for the tragic consequences of this dangerous type of race. The track of the Palio is steeply canted and very dangerous. In the past, the race lasted about 3 minutes. Today, after applying changes to make the race even more spectacular, the 3 laps are completed in only 1 minute. The horses used are no longer the robust but slower horses from Tuscany, but light and fast crossbreeds not suitable for running on the steeply canted track of the Palio di Siena. In 2000, the city of Siena has adopted a series of measures to ensure the protection of horses and riders, such as setting up curve protections to high absorption in PVC and the intervention on the composition, method of implementation and monitoring of the layer of turf. They also perform blood tests on horses, which are quite useless since they are carried out by the same organizers and not by the ASL (Local Health Control). Due to the cruelty of the Palio, Italian Animal Right Activists have campaigned against the race for many years. The campaign against this race is tough since it is inherent in the local and Italian culture and a vast majority of the Italian society defend this event. In 1999 charges were pressed against the veterinarian, the captain and another member of the Contrada Capitana dell'Onda for doping and abusing the horse Lobis Andrea and they were sentenced to pay a fine of 3 million lire (approx. 1.500€ at the time). The long-drawn investigation time led to the loss of crucial evidence and in the end all three were acquitted: but it has been an important step that they have been committed for trial. In 2011, the LAV (Lega Anti Vivisezione) requested copies of the documentation related to the "retired" horses and other "suspicious" facts of the Palio de Siena, but has only received illegitimate denials. More information Italian Horse Protection Association.